Harry Oake's feature film work includes: Hammer Films (1949-62), Thunderbirds 1965/6 (tv) (SFX lighting cameraman), Thunderbirds are go (1966) (SFX lighting cameraman), Captain Scarlett (1967) (tv) (SFX lighting cameraman), Thunderbird Six (1967) (Director of Photography), Journey to Far Side of the Sun a.k.a. 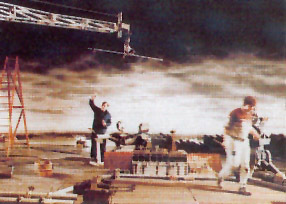 Doppelganger (1968) (SFX lighting cameraman), U.F.O (1969/70) (tv) (SFX lighting cameraman), The Protectors (1971-72) (2nd unit cameraman), Space 1999 (1973-74) (tv) (SFX lighting cameraman), Aces High (1976) (SFX lighting cameraman), Superman the movie (1978) (Model unit cameraman, for a few months only standing in for Paul Wilson), Flash Gordon (1979-80) (Model unit lighting cameraman), Superman 3 (1982) (Model unit lighting cameraman), Terrahawks (1983-84) (tv) (SFX lighting cameraman), Aliens (1985) (Model unit lighting cameraman), Superman 4 (1986-87) (Model unit lighting cameraman), Memphis Belle (1989) (Model unit cameraman), Space Precinct (1994) (tv) (SFX photography, first 10 episodes only). Q: The actual film credits list yourself and Leslie Dear (who seems to have worked with you a few times in the past) as visual effects cameramen. However, the VFX "unit list" lists yourself and Paddy Seale. Did Paddy Seale start the picture and if so was he replaced at some point into filming? HO: I was on "Aliens" from the start and Leslie Dear a little later. Paddy started a few weeks (October 7th) later with Steve Begg directing. We worked mostly on different stages and shots. i) A.P.C. (LARGE),	ii) A.P.C. (SMALL),	iii) Dummy A.P.C. (used for APC limps to a halt smoking and acid scarred shots) 25th November to 29th (call sheet 46). Cinefex (a special effects magazine that came out after the movie and the only source on the SFX of Aliens) only mentions the 1/6th scale, 4 feet long model APC and does not mention the dummy APC or the smaller version (that was presumably used in the Sulaco loading bay). Were there 3 different versions of the A.P.C used for filming? Why was it necessary to use a dummy? HO: I think there were three different scale models of the A.P.C. The dummy was used for when the A.P.C. was in the background and no action was required. Q:What is/was the North Tunnel? (Mentioned with the shots through the Jordan Tractor window FX 18, 21, 22?) Was the part of one of the effects stages? HO: The North tunnel was constructed by Rank in 1948 for a system known as the Independent Frame, mainly used for using projection screens to replace sets. It was not very successful. I believe only one production was shot using the system. Since then it has been used for shooting rear and front projection. rig on M stage at Pinewood Studios, London England. Photo from Cinefantastique, October 1986. Q:Do you remember what the separation of the crash sequence between two sequences: (i) "wire/crash (A) Drop Ship" and (ii) "crash (B) sequence" was for? HO: I only recall the final crash sequence. Bob and Dennis Skotak based it on the crash sequence in Doppelganger (The Far Side of the Sun) which I also worked on.